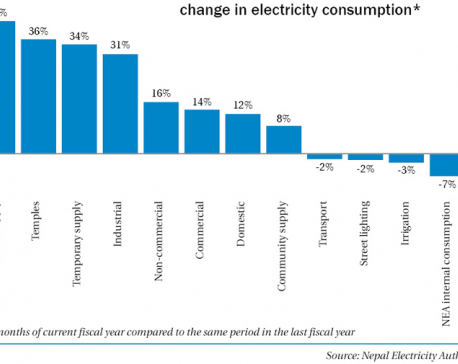 KATHMANDU, May 24: Revenue collection increased by 20 percent year-on-year over the first 10 months of the current fiscal year. According to Inland Revenue Department, a total of Rs 188 billion has been collected till the first 10 months of the current fiscal year, up from Rs 179 billion in the same period of the last fiscal year. The collection is 105 percent of the target set by for the period, IRD said in a statement issued on Tuesday. According to the statement, income tax collection surpassed the target by 7 percent to Rs 101.81 billion, while collection of Value Added Tax (VAT) and Excise Tax exceeded the target by 1 percent and 8 percent, respectively, to Rs 48.32 billion and Rs 37.28 billion. However, Education Service Tax and Health Service Tax missed the target by 1 percent and 12 percent of the target, respectively. The government collected Rs 642 million from Education Service Tax and Rs 789 million from Health Service Tax in the first 10 months of 2016/17. According to the statement, income tax collection in the first 10 months of the current fiscal year grew by 15 percent and VAT posted a growth of 25 percent compared to figures of the first 10 months of 2015/16. Collection from Excise Tax and Education Service Tax increased by 32 percent each, while collection from Health Service Tax saw a growth of 24 percent. IRD is confident that its annual target of collecting Rs 233 billion will be met by the end of the fiscal year. The tax collection figures, however, do not include taxes, including customs tax, excise duty and VAT, collected at the customs points.